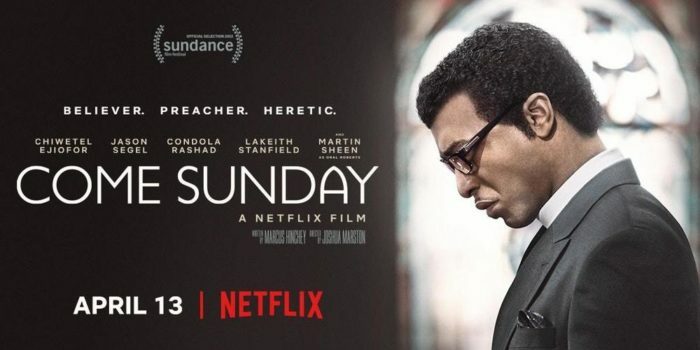 Movie Churches: Let's Netflix and...discuss theology? The plot summary for the Netflix film Come Sunday, the blurb that helps viewers decide whether they want to watch it, gets something crucial wrong. 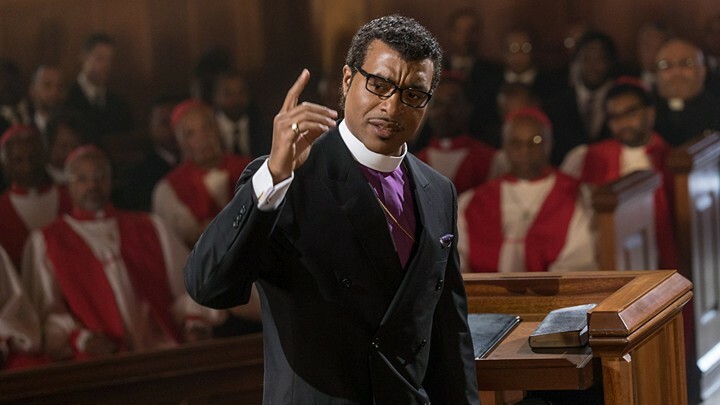 It reads, “A crisis of faith sets renowned fundamentalist preacher Carlton Pearson on a new spiritual path that jeopardizes everything he holds dear.” Pearson is a real person and the film purports to tell his true story, but the summary calls him a “fundamentalist” when he was, in fact, a Pentecostal. This may seem like a minor point, but the film is about a man’s change in theological belief, so points of theology are not minor. Netflix would deserve a little more grace in the descriptive error if they weren’t also the creators of the movie (in conjunction with the NPR program This American Life). Pearson was a prominent pastor, leading a megachurch, Higher Dimensions, in Tulsa and a preacher on Trinity Broadcasting Network. He was a counselor for presidents, both Bill Clinton and George W. Bush. He went to Oral Roberts University and was mentored by Roberts himself. 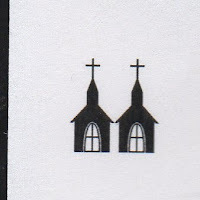 He was ordained in the Church of God in Christ. The film touches on all of these facts. Pearson came to believe that God told him that the victims of 1994 genocide in Rwanda would go to heaven without fear of hell. He came to believe that there is no hell and no need for salvation. This change in theology and the effect this change had on Pearson’s life and ministry is the subject of the film. From watching Come Sunday, I believe Pearson (played by Chiwetel Ejiofor) had some real problems in his theology and ministry long before the changes that brought down his ministry. In the film, Pearson’s Uncle Quincy (Danny Glover), who’s in prison, says he wants to be saved. He also asks Pearson to write a letter to the parole board. Pearson questions his motives and leaves. One of my problems with Pearson here? He should be visiting prisoners, as Jesus called us to, especially his uncle, whether or not his uncle asked to be saved. It isn’t his job to judge Quincey’s motives. When Quincey dies, Pearson conducts his funeral, where he speaks of his uncle being in hell. His mother talks about other relatives of theirs that are in hell. I happen to believe in hell, but I have no idea who is there. It takes a certain arrogance to believe you know the eternal destiny of other individuals. We also see a scene of Pearson meeting with Oral Roberts, who calls Pearson “his black son.” Roberts turning his back on his son when that son came out as gay. Pearson’s silence seems show agreement with Roberts’ choice. Is that how a father should treat his children? Not taking a stand here about whether homosexuality is a sin, but even if you think it is, is there a Scriptural basis for denying your child? I don’t see it. Pearson doesn’t seem to treat his family particularly well. He doesn’t spend much time with his wife, Gina (Condola Rashad), and she makes it clear she doesn’t believe he cares about her opinions. When he talks to a woman on a plane, Pearson refers to his childrens “a pain in the a**”. And when his associate pastor, Henry (Jason Siegel), tells him he’s always put Pearson before his own family, well, Pearson seems to have no problem with that horrible decision. What I’m saying here is, the Bishop Pearson we see at the beginning of the film does have room for change and growth. 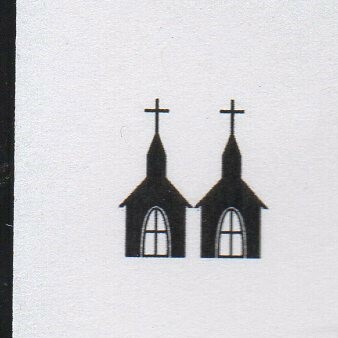 In the opinion of Movie Churches, the direction he chooses is worse. He goes before his congregation on a Sunday morning and tells them that God told him in a vision that there is no such place as Hell, and there is no need to share the Gospel because everyone will be saved anyway. This upsets people in the congregation -- and all of Pearson’s associates in ministry. These questions about the balance between love and justice have been debated for centuries. I remember discussing and arguing about the justice of hell back when I was in high school youth group. Pearson seems to be thinking about these issues for the first time after decades in ministry. In recent years there has been much discussion about whether Hell is real, particularly in the ministry of Rob Bell. I have good Christian friends who have made many of the same changes in their theology in accord with Pearson and Bell. But those who want a place of leadership in a church must realize they can’t teach doctrine that conflicts with the official doctrine of that church. A Socialist who came to a realization that Capitalism was a good thing that led to prosperity for the greatest number of people would be foolish to expect to remain prominent in the Party. A chef wouldn’t expect to keep their job in a vegan kitchen after serving bacon to customers. The film seems to present the people who left Pearson’s church and the council of bishops who expelled him as acting outrageously and unjustly. Pearson should admitted he no longer held to the beliefs of his church and the denomination he was ordained in and resigned from it, rather than putting many people through such difficult choices. In the end credits we see that Pearson is now a minister in the Unitarian Church, at All Souls in Tulsa. His beliefs are consistent with the teaching of that denomination and in integrity he should have made that change years sooner rather than waiting while the church he founded crumbled around him. 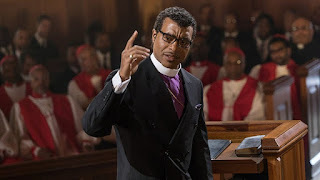 We’re giving the Bishop Carlton Pearson and his ministry as presented in the film Come Sunday a Movie Churches rating of Two Steeples. Let's Netflix and...Save the school!